Is there a better alternative to Detour? Is Detour really the best app in System category? Will Detour work good on macOS 10.13.4? 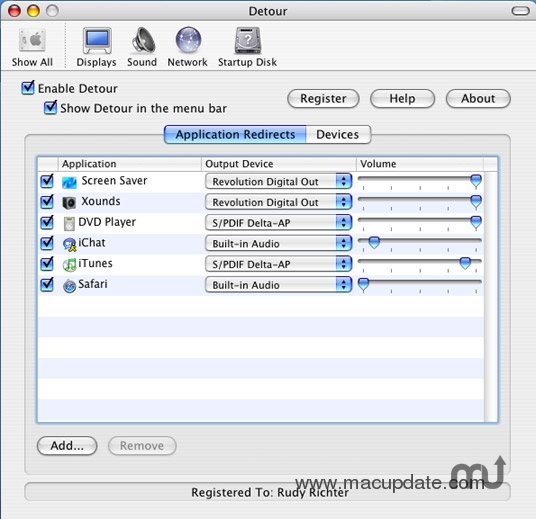 Detour lets you control where audio from all your programs is going. Whether you send it to your speakers, your headphones, or mute it all together, you're in charge. Send music from iTunes to your external speakers and keep the annoying beeps and blips of iChat going through your computer's built-in speaker. Mute any application's sounds all together. Detour needs a rating. Be the first to rate this app and get the discussion started! Change the volume of some applications relative to others. Make your email client's alerts quieter, and you'll never again be jarred from work just to receive spam. 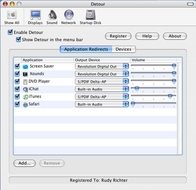 When you use Detour, you can choose between your speakers, headphones, built-in speaker, iMic, MiniDisc player or anything else which the system sees as an audio output and send it the audio from a specific application. Along the way, you can adjust the volume as well.